For over 30 years, Cienta has been specializing in creating high-quality vulcanized footwear for children. Founded in 1982, the family-owned company Calzados Cienta started the kids' canvas and slipper brand with generation's worth of expertise in shoe-making. Wonderful shoes. Keep buying it because it’s comfortable, never out of style and easy to put on. Great quality, great fit. My daughter has got 10 right now but i got her 10.5 and it works well and got some room to grow. Zappos is truly amazing. Package comes in two days. Returns processed at the same speed and NO PLASTIC in their packaging. Thanks Zappos you make our life is much easier!! Great shoe! I bought the navy version for my daughter to wear with her school uniform. She likes them so much we decided to her her another pair that she can wear when she’s not in school. Cute casual shoe. Great uniform shoe for my daughter. She previously had a pair of Keds that looked similar but they do not carry above a size 12. 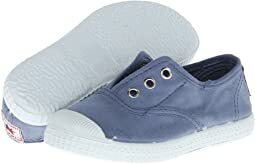 While these are not leather, they seem to be a sturdy shoe so far and she says they are very comfortable. My 4 year old has not changed shoes since getting these. Great for running around the playground and can easily go with any outfit. Cienta shoes are my kids favorite shoes. Super comfortable and last. We usually buy the Mary Janes but glad we tried the sneakers. Only downfall is the insert in the shoes always come out. Very cute and easy to put on. This brand seems to run1 whole side small. I only knew what size to buy from a previous purchase I made and had to exchange. My toddler daughter is usually a US size 4, and we had to purchase a US size 5 in this brand. Love the shoes, but good to know that they run small! These were recommended by a friend. We're still working out sizes - we measured her foot and everything and ended up with a pair of shoes too big. They look awesome, and they do indeed smell like strawberries. I think that will be lost on the 2 year old.Ordering the small size now. Very nice and comfortable shoes. The size is just perfect and the smell is great!!!!! I bought these for my daughter. She really liked them and they were comfortable. They also had a sweet smell like grape lip balm. But she is super sensitive and the glitter was "scratchy" to her. If your kid isn't super sensitive, they may love this shoe. Cute slip on sneakers, but I highly recommend going a 1/2 size up from what you normally wear. My daughter loves these shoes. First of all they smell like berries or sweet candy! My daughter is in a 10 and I sized up a little so she could have room to grow. The 10.5 is perfect!! These run true to size in my opinion. We tried the 11 and it was huge. 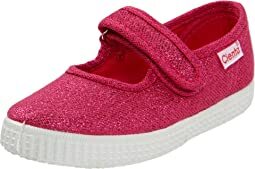 These Cientas will definitely be a yearly staple in my girls wardrobe and Zappos is amazing as always! Super fast shipping and the best selection of shoes on the Internet hands down!! Their service is amazing too. Thank you Zappos!! These are cute and comfortable, but they were just too small. Even if they fit, I would have had to return them because the bubblegum chemical smell blew me away. I had to put them in an unused room until I had time to return them. Omg do these shoes smell of bad car air refresher. It’s embedded in the fabric. My daughter called it sweet sick purple smell. Aside from that both insoles weren’t even attached. But it’s the horrid stink that’s the real deal breaker. My daughter loves this shoes. The design is so Cute. In addition to that, no shoelace is convenient for her! I was looking for a mostly neutral shoe for my daughter that would work for her narrow feet. Mary Jane styles work well for her since they can be adjusted a little tighter with the velcro when needed. These seem well made, have a nice sturdy textured sole - my daughter is comfortable playing in them. They are soft enough on the heel rim and upper rim that she can wear them without socks and not get rubbed raw like some other shoes. Bought these for my daughter in the US size of her other shoes that fit, and they seem a little small. I should have sized up... just a size. Otherwise, cute style. Very functional. Well crafted. The shoe is cute and the material seems very comfortable, but the shoes are scented. The scent was so strong that I couldn't keep them. 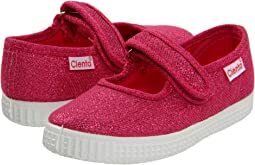 I have purchased many shoes for my daughter on this site and they have all been very cute and well-made shoes. These shoes I have to say are poorly made. I opened the box and removed the shoes and the padding in the shoes fell out. They were not glued in or secured in the shoe and just fell out and might I add they were flimsy padding. This sneaker also does not have any foot support. The material is of poor quality and overall I am very disappointed with these shoes. They are cute looking but the quality is horrible. I would not recommend this shoe. Super cute shoes. However, my daughter has SUPER narrow feet, so these were too wide for her and we had to return them.